Properly preparing walls for painting is the key to creating a beautiful space. To give your home a flawless, new look, use our simple-to-follow tips and learn how to prepare your walls for painting.Begin by removing as much furniture as possible from the room. Use drop cloths to cover the floor and any remaining furniture. While plastic is ideal for furniture, canvas drop cloths absorb paint, are not slippery, will not move, and can be reused. Next, remove any pictures, mirrors, window treatments, and electrical/light switch plates. Loosen the ceiling plates of hanging light fixtures and cover the fixtures. Because surface dirt can cause poor adhesion, use a light detergent to wash surfaces that are soiled, that are touched often, or that may have any oily residue from cooking. Take care not to leave any residue from the detergent. Wash doors and trim, particularly where they are handled. After they are clean, wipe surfaces with a damp cloth and allow them to dry before painting. To prepare a wall for painting, use a liquid detergent to remove as much of the markings left by pens, crayons, and water stains as possible, and wipe with a clean wet cloth. For any remaining marks, spot prime the affected areas with Moore's® QD 30® or Fresh Start® to prevent "bleeding" through the finish coat. To ensure proper adhesion, sand glossy surfaces with fine sandpaper. Be sure to remove sanding dust. Vacuum surfaces clean and wipe with a tack cloth. Examine floor, wall, and ceiling surfaces for nail holes, cracks, or any other surface imperfections. Use a putty knife to rake out any large plaster cracks or loose particles in your walls and ceilings. Firmly press spackling compound into crevices with a putty knife and smooth until the compound is flush with the surface. 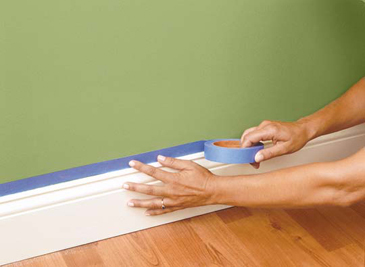 To fill mitered trim joinings (which are open) and door or window trim that is separated from your wall, press the compound into the crevices, and smooth it with your finger. Allow it to dry and then sand lightly. Because patching compound shrinks when it dries, it is often necessary to apply the compound a second time after the first coat has dried. When preparing your walls for painting by performing spackling work of this kind, we recommend Moorlastic® Lightweight Compound and Moorlastic Vinyl Spackling Paste. Use a putty knife to remove any loose or scaling paint. When you remove paint from walls or ceilings, sand paint edges to ensure a smooth surface. This will marry the two levels of paint so the edges will not be noticed when it is re–coated. When removing paint from the sash, trim, or doors, use a fine sandpaper to sand the entire surface.